While in South Africa in 2011, Carter and Olivia learned first-hand about the Rhino poaching situation there. Deeply moved by learning that rhinos are on the brink of extinction, the kids decided to get involved. With OMG, they then developed a campaign to educate students around the world about the need to save the species. 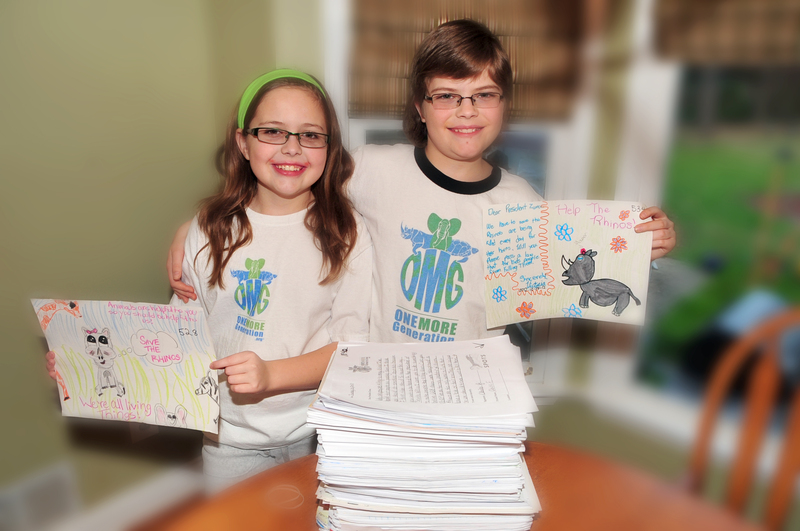 As part of the campaign, Carter and Olivia aimed to collect 1,000 letters and hand-deliver them to the South African President, Jacob Zuma. The letter writing campaign has reached tens of thousands of youth from all across South Africa and the globe, and, with just over a year of campaigning, and with the help from the folks at Rhino SA they have collected over 8,000 letters! These letters and their delivery are historic for the preservation of South Africa’s heritage and the youths’ future. Olivia and Carter will be visiting South Africa from Oct 25, 2013 and will be partnering with the Green Wall of Africa and RHINO SA in this groundbreaking trip. Our goal for the trip to South Africa is to partner with the youth of the country in order to allow them to become involved in the educational value of the project. The awareness factor of our project has a direct impact on eco-tourism by helping preserve the species, which in return will ensure visitors from around the world to still have the opportunity to see one of the Big 5. Not only are we exposing the issues surrounding this serious matter, but we are striving to provide a socio-economic upliftment platform to assist and provide communities with opportunities in which to become involved. The consensus amongst the role-players within the campaign is that this upcoming trip to South Africa is crucial. Our mission is to ensure that the voices of South Africa’s youth are heard around the world: in order to achieve this, the team will be travelling with an international film crew who will film and produce a documentary covering Carter and Olivia’s journey around South Africa. During the film, we will not only be working with some of South Africa’s most endangered species, but also the people and organizations trying to save them. Our travels will take us around the country, visiting the Kruger National Park, KwaZulu Natal, Northern Province and Johannesburg to film onsite interviews, wildlife and culture. Olivia and Carter as OMG, on their return to the United States, plan to continue working with the Green Wall of Africa and RHINO SA by sharing knowledge, developing and implementing strategies and creating education and awareness platforms to enrich and uplift conservation and environmental programs for the further benefit of all South Africans and their natural heritage. The One More Generation film is the first step in what will be an ongoing global endeavor designed to build opportunities for the youth of South Africa and around the world—for the benefit of generations to come. Film is the most powerful way to spread a message and to share experiences, and OMG is looking for sponsors and partners to screen this sure-to-be vital document. If you are interested in getting involved in our project, please send us an email (info@onemoregeneration.org) and let us know how you can help. Thanks in advance from all of us at OMG for all the support.